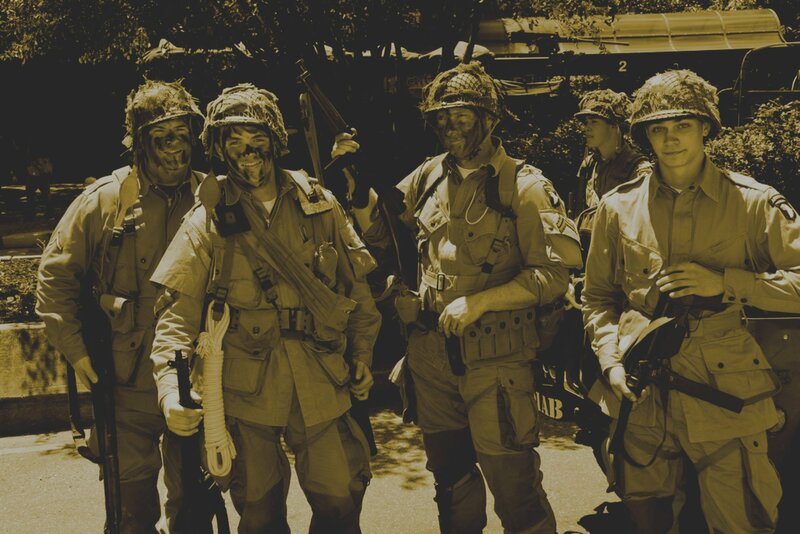 THE MID-ATLANTIC AIR MUSEUM'S WORLD WAR II WEEKEND POLICY IS THAT ALL RE-ENACTORS MUST BE LISTED AS A PARTICIPANT OF A PRE-REGISTERED RE-ENACTMENT GROUP PROCESSED BY MAAM. AN INDIVIDUAL WHO IS A MEMBER OF A PRE-REGISTERED RE-ENACTMENT GROUP, BUT NOT ON THAT GROUP'S PRE-REGISTERED LIST FOR THE EVENT, MUST PAY THE ADMISSION FEE TO ENTER. NEW RE-ENACTOR GROUPS MUST MAKE A REGISTRATION REQUEST TO MAAM BY E-MAIL NOT LATER THAN JANUARY 1 TO BE CONSIDERED FOR PARTICIPATION IN THE CURRENT YEAR'S SHOW. ALL PARTICIPANTS MUST BE WEARING PROPERLY SECURED WRISTBANDS FOR ENTRANCE AT ALL TIMES DURING THE SHOW. RE-ENACTORS WILL BE ABLE TO REENTER AFTER THE 7:30 PM GENERAL PUBLIC CURFEW IF THEY ARE WEARING THEIR WRISTBANDS. RE-ENACTORS MUST ENTER AND EXIT THROUGH GATE #5, ONLY. EXCEPTION: HANDICAPPED RE-ENACTORS, REGISTERED AS SUCH, AND IN POSSESSION OF THE AUTHORIZING REGISTRATION LETTER MAY USE THE FRENCH VILLAGE GATE. ALL REGISTERED RE-ENACTORS MUST BE WEARING THEIR PERIOD UNIFORM/PERIOD DRESS FOR ENTRY ON FRIDAY, SATURDAY OR SUNDAY DURING SHOW HOURS. ALL VEHICLES MUST BE PRE-REGISTERED THROUGH A PARTICIPATING RE-ENACTOR GROUP, OR OTHER PARTICIPATING GROUP. THE MID-ATLANTIC AIR MUSEUM CANNOT ALLOW VEHICLES BELONGING TO THE GENERAL PUBLIC TO BE DISPLAYED AT THE EVENT. THE PRE-REGISTRATION DEADLINE FOR VEHICLES IS MAY 1ST. CLICK HERE TO GO TO THE REGISTRATION PAGE.